October was rich in philatelic events and rare stamps sales. In this review, you will find the most valuable and remarkable stamps sold at philatelic auctions during the past month. Some of these pieces are considered the most significant items of international philately. 1875 stamp. Daniel F. Kelleher Auctions image. This is one of the specimens from a special printing, which consists of 32 stamps. The stamp has been created in 1875, and it is one of the finest examples ever offered at stamp auctions. The piece has no gum as issued. The green and black stamp with an overprint have an authenticity certificate. 1860 stamp. Michael Rogers Auction image. This is one of the 1860 used stamps offered at a Michael Rogers event, which received the highest bid due to its great condition. This is a reperfed piece with several certificates proving its authenticity and value. The stamp has a red grid cancel. 1951-1975 collection. Kelleher & Rogers image. This is an exquisite collection of deluxe proofs, which are particularly rare. The assemblage is remarkable for its complete Bao-Dai first issues. Experts claim that this is one of the most valuable collections in existence. 1857 card cover. Robert A. Siegel Auction Galleries image. 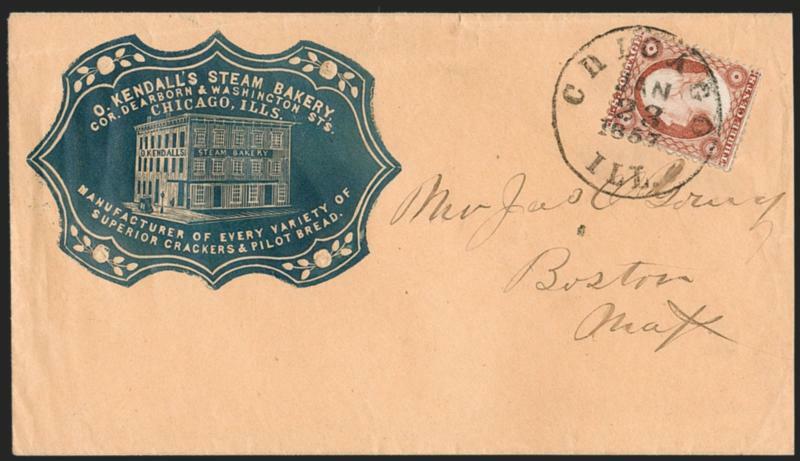 The Chicago perforation used on the stamp is the aspect that makes the cover valuable and remarkable. It is believed that the stamp was distributed by R. K. Swift. The purpose was to push the sales of the perforating machine. Dairying parcel post. Downeast Stamps image. This is a block of 50-cent Dairying stamps, which can be rarely met at philatelic auctions. The lot is never hinged and in very good condition. According to the auction website, the block has a fairly visible stain in the selvage. Originally, the stamp was supposed to display a steel mill but, due to confusion, the design was changed and the image of cows was printed on it. 1880 stamp. H. R. Harmer image. This is another special printing sold at a philatelic event in October. It is a black and brown stamp created in 1880. It is a notable specimen of this series, which is believed to be centered better than the majority of the copies available in the market. There are less than 50 certified stamps of this kind while many of them have some defects. This sold specimen is just fine. 1902 stamp. Cherrystone Auctions image. This is a variety of the 1902 stamp issued in the United Kingdom. The stamp is unused and in very good condition. However, it has no gum as well as all the 7 copies of this stamp known to exist. These stamps are considered a great rarity, and this specimen is one of the finest (it is a certified lot). 1867 stamp. Daniel F. Kelleher Auctions image. This is another unique stamp sold in October at a stamp auction. The 1867 F. grill issue is indeed rare, and many of these stamps have a certificate. However, this lot is the only known example of never hinged stamp of this grilled issue. Stamp of UK. Universal Philatelic Auctions image. The lot is another example of rare stamps of the UK. This beautiful horizontal pair of blue stamps portrays Queen Victoria. The lot is in very good condition, with some minor defects. The piece is marked by a KELSO Maltese Cross, which has made it particularly valuable. 1869 stamp. Robert A. Siegel Auction Galleries image. The final lot in our review is a true rarity in the world of philately. This is an 1869 stamp with inverted vignettes. Experts in the field claim that the piece is one of the most notable stamps in the US philately. The lot is in great condition, with just a tiny speck and a minor scratch.